Weddings are most auspicious moments in the life of an individual whatever their socio-cultural background may be. As weddings are considered a great occasion for fun, feast and frolic, the empress of the occasion is undisputedly no one but bride. In Indian weddings the Indian bride is star attraction of the day as she gets maximum attention on the big day. 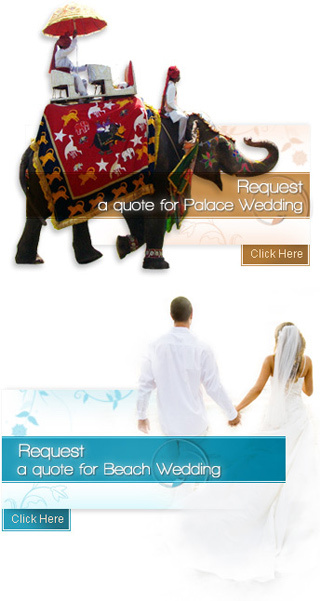 Wedding is one of the precious events in the life of an Indian bride. The only thing that she wishes for is that everything takes place smoothly on the main day. Not only this, but she also wants to look her best on this day. This would mean that everything from her dress to her make up would be just right. Looking good ultimately leads to feeling good. Everything that the bride wears on this day, must suit her personality and liking. Since, it is essential that everything the bride wears suits her well, there are several preparations that need to be taken care of. These preparations for the Indian bride include buying the right dress, buying appropriate jewelry, getting the accessories in place and taking good care of one's hair and skin. Apart from these, there are several other things that are used to groom the Indian bride and make her look as pretty as ever. These include Bridal Mehendi, Bridal Bangles, Bridal Handbags and Purses, Bridal Shoes, Bridal Ethnic Wear, Bridal Make-Up, Bridal Accessories, Bridal Skin Care, Bridal Hair Care, Bridal Jewelry and Bridal Saris. While choosing these, it is important that the bride's personality and choice is kept in mind. It is important that all these things are used in the right manner to make the Indian bride look elegant. All these can be availed in any of the Pre-wedding Bridal Package. You could also avail of the other facilities that are offered to make the Indian bride look as beautiful and charming as possible. The facilities and services have been designed keeping in mind the latest trends.